The stalked jellyfish (Stauromedusae) is a relatively unknown member of the class Scyphozoa, the true jellyfish. Many people who see Stauromedusae do not realize that they are looking at a jellyfish because of the stalked jellyfish's unique anatomy. Stalked jellyfish are distinct from other jellyfish because they live their lives as sessile polyps rather than free-swimming medusae. The tiny Stauromedusae can be found attached to eelgrass, algae, rocks, or other substrates. To a certain extent the stalked jellyfish resembles an inverted medusa, with its tentacles extending upward from the bell. This stalked jellyfish is the same color as its substrate, which provides camouflage. The stalked jellyfish’s body is composed of a funnel-shaped calyx, or bell, and a stalk with a sticky basal disc at the end. The calyx is divided into eight lobes. Some Stauromedusae, Lucernaria quadricornis for example, have four paired lobes instead of eight separate ones . There are clusters of as many as 100 stinging tentacles at the end of each lobe . 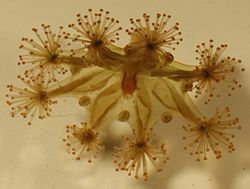 Some species such as Haliclystus salpinx have eight adhesive anchors, or primary tentacles, located between their eight lobes, but this feature is not present in all species . Stauromedusae have eight gonads (the reproductive organ), with one gonad in each lobe. Stalked jellyfish come in a variety of colors, including green, brown, orange, red, yellow, and pink . It has been noted that the color of the stalked jellyfish often matches the color of its substrate (the base it attaches to), which provides camouflage and protection from predators. This is partly because, in certain species, the stalked jellyfish has the ability to absorb the pigment cells of its substrate (algae, for example) through the basal disc and gradually take on the substrate's color . Stauromedusae are small, usually only two to five centimeters in length. The mouth is located in the center of the calyx and has four lips . The mouth is above the manubrium (a four sided collar) and leads to the gastrovascular cavity, or coelenteron, which is divided by four hollow septa. Digestion takes place in the coelenteron, which is also a part of the hydrostatic skeleton and aids in supporting the organism . Unlike most jellyfish, the stalked jellyfish does not have a free-swimming medusa stage. The adult animal is a sessile polyp that uses its sticky basal disc to attach itself to eelgrass, algae, rocks, and other surfaces. Certain species can move by a somersaulting motion after detaching from their substrate. They use their anchors to attach to substrates and then release, propelling the organism through the water . Other stalked jellyfish can slide their base slowly over their substrate . However, some species secrete a glue-like adhesive from their basal disc that permanently attaches them to their substrate . Stalked jellyfish can stretch and contract their bodies to reach out and grab food while remaining attached to their substrate by contracting either the longitudinal muscles in their stalks or the circular muscles in their calyxes  . Like most Scyphozoans, members of Stauromedusae have no structures for respiration and perform this function by diffusion on the cellular level. They have one opening (the mouth) for taking in food, excreting waste, and ejecting eggs, and they are diploblastic (having two cell layers), with an outer epidermis and an inner gastrodermis . They receive stimuli through a nerve net, although certain species, such as Haliclystus auricula, have a more complex nerve plexus on their outer surface . Stauromedusae also have simple eyes called ocelli, which can detect light but not direction, shapes, or colors . Stauromedusae can reproduce asexually by budding (this usually occurs in the spring) . The polyp forms buds that break off to become unciliated planulae that will develop into adult Stauromedusae polyps . Unlike most jellyfish, stalked jellyfish do not have strobilization, the process where the polyp forms ephyrae (jellyfish larvae in the medusa form) that break off and develop into adult jellyfish. Stalked jellyfish also do not go through alteration of generations, the reproductive process where medusas reproduce sexually to make polyps, which then reproduce asexually to make medusas, and so on. Instead, the stalked jellyfish remains in the polyp stage throughout its adult life. Sexual reproduction occurs during the polyp stage. Stauromedusae reproduce sexually by external fertilization and have separate male and female sexes. In the summer, the male and female jellyfish release their eggs and sperm into the water and the egg is fertilized . The planulae that hatch are unciliated, and move about with a creeping motion by contracting their endodermal cells . Since the planulae crawl rather than swim, the stalked jellyfish have a limited ability to disperse. The planulae travel in large groups until they mature. Alone, they are unable to catch any food and will soon die, but when traveling in groups the planulae can catch and eat small organisms. After a few days the planulae develop into juvenile polyps . The immature polyp develops into an adult through metamorphosis where it gains its adult organs, including gonads, ocelli (simple eyes), circular coronal (around the head) muscles, and rhopalioids . Stauromedusae can be found attached to eelgrass. Stauromedusae catch prey with their stinging tentacles. Like other Cnidarians, they have poisoned barbs called nematocysts that shoot out of the nematocytes, located on the tentacles . Stalked jellyfish use their tentacles to immobilize or kill prey. They drag the prey into their central mouths with the tentacles on the end of their eight lobes. Stalked jellyfish feed on small benthic organisms that come within the reach of their tentacles. Their diet consists primarily of small crustaceans such as copepods, amphipods, ostracods, and isopods. They also eat bivalves, snails, fly larvae, small marine worms, and brittle stars  . Stalked jellyfish attach themselves to a substrate such as algae, eelgrass, or rocks and usually remain there for the rest of their lives. 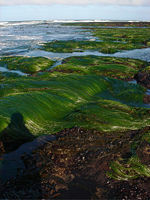 They live in the benthos, or floor, of the ocean. They are commonly found in cold, shallow waters with enough water circulation to bring food to the jellyfish . The jellyfish's tentacles move through more water when they are attached to eelgrass or algae because the movement of the plant also moves the stalked jellyfish through the water . Stauromedusae have a limited dispersal because their planulae cannot move very far and thus remain close to the parent jellyfish. Stalked jellyfish live mainly in the cold shallow waters of the northern hemisphere . They can be found in both the Pacific and Atlantic Oceans. Stauromedusae are protected from most of their potential predators by the stinging nematocysts in their tentacles. However, a few organisms, including some nudibranchs and tubrellians (flatworms) consume the stalked jellyfish in spite of the tentacles, and recycle the nematocysts to use for their own protection . Most species of stalked jellyfish are found in shallow waters, up to about 33 feet deep . However, new species of Stauromedusae have recently been discovered in large populations around deep sea, hydrothermal vents at a depth of about 8500 feet . One such area was named the Medusa vent field because of the appearance of the stalked jellyfish and tubeworms that populate it . Four different vents along the East Pacific Rise have been discovered with populations of Stauromedusae. This is puzzling to scientists because Stauromedusae do not have a large potential for dispersal, and yet they are found in such distinct and far apart environments. Stalked jellyfish at vents live with temperatures of up to 626 degrees Fahrenheit at the mouth of the vent, as well as extremely high pressure . The Stauromedusae found at vent locations include the species Lucernaria janetae and a few others . The species from these vents were studied and found to have several differences from other Stauromedusae. Stalked jellyfish found at deep sea vents were much larger than species from more shallow waters, with a width of up to 10 cm. 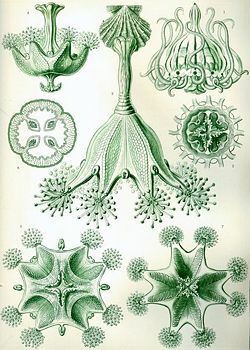 They had differences in their stalks (a single chamber in the stalk rather than four chambers) and gonads compared to other species and lacked the primary tentacles (rhopalioids) present in other species such as Haliclystus auricula . These findings have been used to support the argument that Stauromedusae should be put in its own class (Staurozoa), on the same level as Hydrozoa and Cubozoa, because it is different enough biologically from the other classes of Cnidaria to be made into a separate class . Lucernaria quadricornis Kåre Telnes, The Marine Fauna Gallery of Norway, accessed 10/22/08. Haliclystus auricula Marine Biological Laboratory, 2007, accessed 10/22/08. Lucernariopsis campanulata Jessica Heard, The Marine Life Information Network for Britain and Ireland (MarLIN), 03/09/2007, accessed 10/22/08. Stauromedusae Dave Wrobel, The JelliesZone, accessed 10/22/08. Haliclystus auricula Sunil Naik, University of Michigan Museum of Zoology: Animal Diversity Web, 2000, accessed 10/22/08. A Functional Biology of Scyphozoa Mary N. Arai, Springer, 1997, accessed 10/22/08. Schyphozoans Dustin Molte, Amy Manning, Neil Stoff, and Odette Williams, scyphozoans.tripod.com, accessed 10/22/08. Stauromedusae/Staurozoa Claudia E. Mills, 8/4/2005, accessed 10/22/08. Staurozoa: A New Class of Cnidaria? Allen Collins, Jellyfish of the Month, June 2004, accessed 10/23/08. Stalked Jellyfish Capt. James D. Jones, NAUTIC Video, 2007, accessed 10/23/08. Thaumatoscyphus atlanticus Bay of Fundy Species Information, accessed 10/23/08. Nematocysts Dave Wrobel, The JelliesZone, accessed 10/23/08. Diet of the stauromedusa Haliclystus auricula from southern Chile Carolina J. Zagal, Cambridge University Press, 4/1/04, accessed 10/23/08. Stauromedusan populations inhabiting deep-sea hydrothermal vents along the southern East Pacific Rise Richard A. Lutz et al., 2006, accessed 10/23/08. Haliclystus sp. (Stalked jelly) Mary Jo Adams, Washington State University Extension Island County Beach Watchers, 1/18/06, accessed 10/23/08. New Deep-Sea Hydrothermal Vents, Life Form Discovered National Science Foundation (NSF), Science News, 5/22/07, accessed 10/23/08. A New Deepwater Species of Stauromedusae, Lucernaria janetae (Cnidaria, Staurozoa, Lucernariidae), and a Preliminary Investigation of Stauromedusan Phylogeny Based on Nuclear and Mitochondrial rDNA Data Allen G. Collins and Marymegan Daly, Marine Biological Laboratory, 2005, accessed 10/23/08. Stalked jellyfish Dirk Fleischer, TaucherMonitoring der Ostsee (TaMOs), 9/29/08, accessed 10/24/08. Gazing at Medusa Astrobiology Magazine, 4/20/2007, accessed 10/24/08. Stauromedusae (Order) ZipcodeZoo.com, Bay Science Foundation, 10/7/08, accessed 10/24/08. This page was last modified on 25 July 2014, at 10:54.